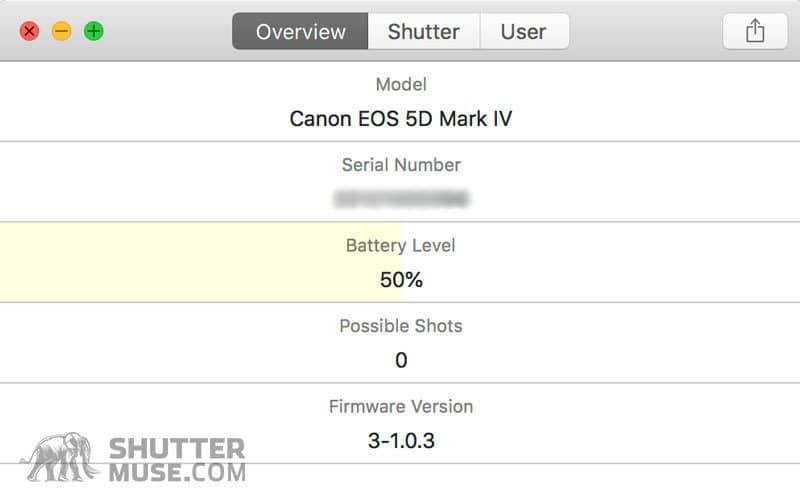 I had an email come in from a reader asking if I knew how to find out the shutter count for a Canon 5D Mark III. Off the top of my head I didn’t know a specific answer, but I was aware that Canon makes it tricky and it would most likely involve using some third-party software. 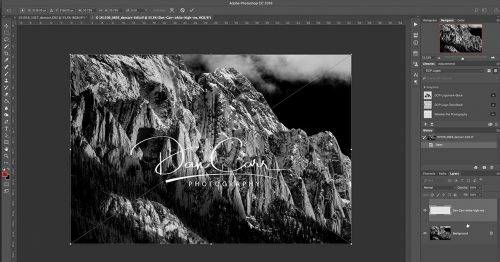 When I did a quick search, I discovered that a new piece of software, ShutterCheck (previously called EOS Inspector), had just launched a couple of days earlier for the introductory price of $2.99 so I decided to purchase it and do a quick review. I make no affiliate commission on this app, and Sorry PC folks, this one is Mac only. 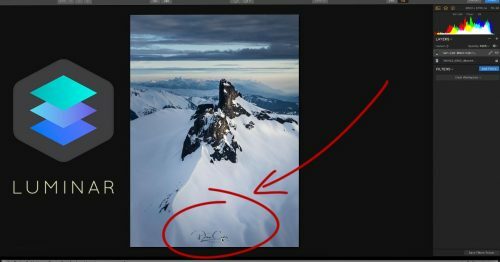 Why Might You Want to Know Your Shutter Count? 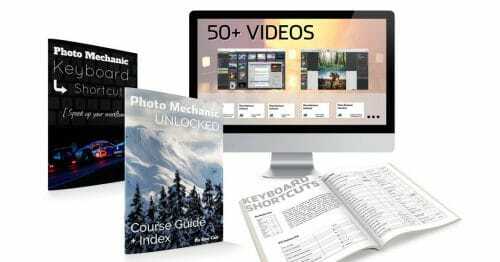 If you’re going to sell a used camera, most potential buyers are going to want to know what the shutter count is on the camera they are buying. 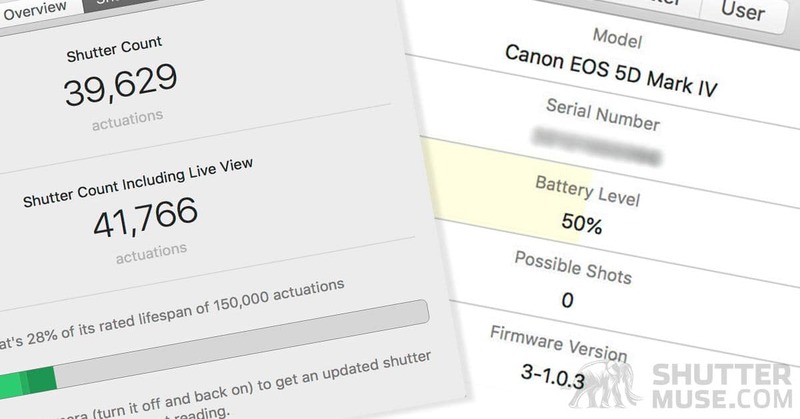 Canon provides estimates of the shutter life of all their cameras, so it’s useful to know if a potential purchase is on its last legs, or has plenty of life left in it yet. It’s easy for second-hand sellers to say “hardly used” on the sales ad, so it’s preferable to get some concrete numbers on that. You might even want to verify that a second-hand seller is being truthful about a camera you are hoping to buy, or you might want the details of your own camera so that you can start planning for a potential failure if it’s coming towards the estimated length of life. Thankfully most people never get anywhere near the shutter life of their cameras unless they are professionals, but the fact is that a shutter replacement is often more expensive than the value of the camera, so a broken shutter mechanism might really be the end. 1D X, 1D X Mark II, 1D C, 5DS, 5DS R, 5D Mark II, 5D Mark III, 5D Mark IV, 6D, 6D Mark II, 7D, 7D Mark II, 40D, 50D, 60D, 60Da, 70D, 77D, 80D, 100D, 200D, 450D, 500D, 550D, 600D, 650D, 700D, 750D, 760D, 800D, 1000D, 1100D, 1200D, 1300D, 8000D, 9000D. Rebel SL1, SL2, XS, XSi, T1i, T2i, T3, T3i, T4i, T5, T5i, T6, T6i, T6s, T7i. Kiss X2, X3, X4, X5, X6i, X7, X7i, X8i, X9, X9i, F, X50, X70, X80. I have no doubt that the app will be updated as new cameras are released, but it seems unlikely that they will go back and add further older cameras at this point. Still, this is a pretty comprehensive DSLR list as far as I can tell. As you would hope, the setup and start of the app is nice and simple. 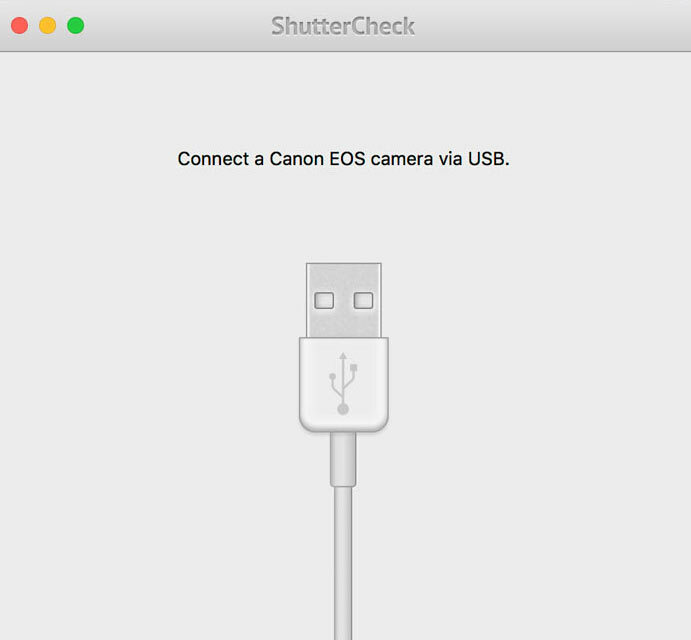 Simply purchase it, download it, connect your Canon DSLR to your computer with a USB cable and then open the app. Whilst the screenshots in this review show results from my Canon 5D Mark IV, I also tested a 7D Mark II which worked in exactly the same way. As soon as you switch your camera on, the app will display information about your camera and shutter count in a simple tabbed display. 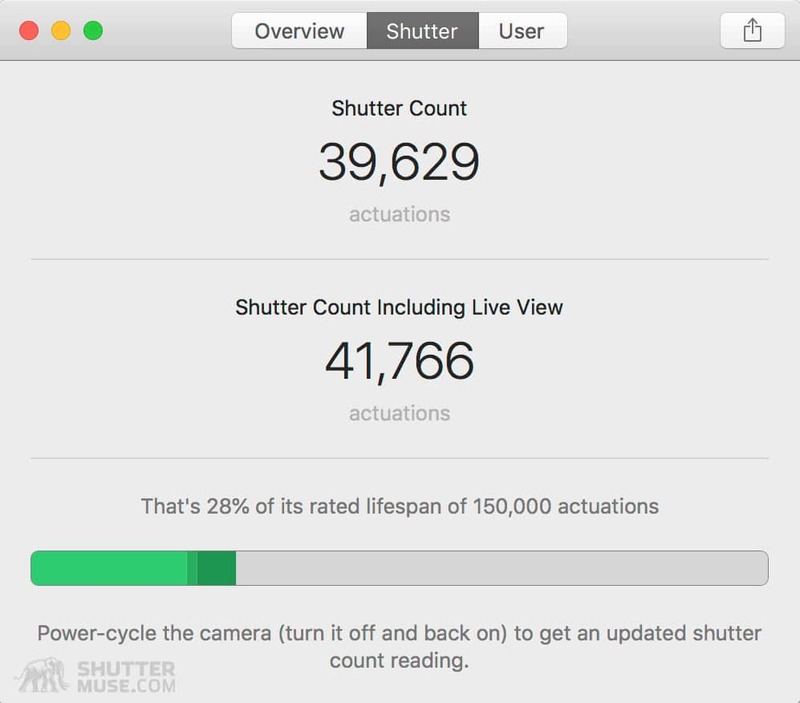 Some of it is extraneous, such as current battery life, but the shutter count is displayed quickly and clearly. It will even include live view shots, and usefully tells you the projected lifespan for your particular camera model. This is a fairly short review by my standards, but it’s a simple app and everything has been covered! It’s still beyond me why Canon don’t just make this information readily available in the camera’s menu system, but it’s good to know that there’s a simple, cheap app out there that can help you out. ShutterCheck works exactly as it should do and is definitely worth a purchase if you are going to be selling or buying a second-hand camera. I particularly love the fact that they tell you what the shutter on your camera model is rated to, and calculate the lifespan percentage that has been used! Any chance they will make this for Windows Computers? I’m sorry, I have no idea. You’ll have to send them a message. Glad I found this review, I just purchased the app and discovered that I’ve already taken 5,810 shots with my “only-2-months-old” Canon T71. It has a rated life of 100,000 actuations, so I’ve used about 6% of its rated life already. That’s a bit concerning, but since it’s new I *HAVE* been shooting it a lot just to familiarize myself with it. I’m sure that “shots per month” figure will drop. Yeah you’re probably right. 6000 in a month is a lot for most people that aren’t calling it their job!